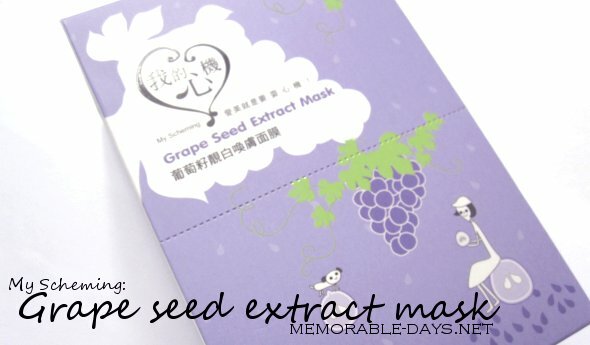 Review: My Scheming Grape Seed Extract Mask | Memorable Days : Beauty Blog - Korean Beauty, European, American Product Reviews. Oligomenic Proanthocyanidins, the main ingredient of grape seed extract possesses good effects on preventing and smoothening wrinkles, and restraining aging. Grape seed extract is a good anti-oxidant and stabilizes collagen. Natural plant extracts are added in the mask to enhance and supplement skin moisture which may be lost in the day. It has a Chinese and an English description at the back of the mask, which is a plus for people who can't read Chinese ;). I really like the packaging of the box and the mask. It has a purple/white packaging with grapes, a girl and a dog on it. On the left picture you can see the opening of the box. One box contains 10 masks ^__^. On the picture below you can see the packaging of the mask, cute isn't it =)? The print is horizontal! You need to tear the packaging open to get the mask out. See picture below, it looks like this when you get the mask out. 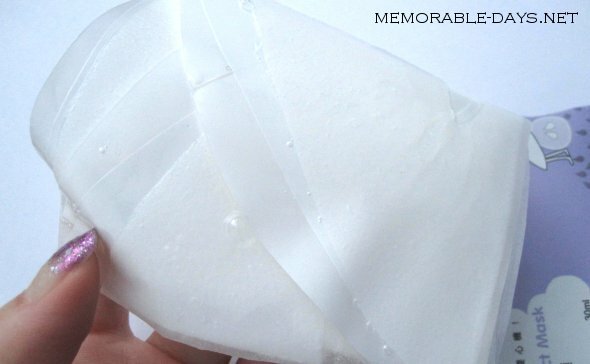 After cleansing your face, you need to remove the pearl paper and place the mask over your face. Press it lightly onto your face. Leave on for about 15-20 minutes. Remove the mask, you don't need to rinse your face after wards. Gently massage the excess tonic on your face and wait till everything is absorbed. Once you tear it open you can smell the scent of grapes ^o^! So nicee~!! It's a thin cloth just like the My Beauty Diary masks. The size of the mask is exactly the same as the MBD masks as well. Ingredients: Collagen, Polyphenols, Xantham Gum, 1,3-Butylene Glycol, Grape Seed Extract, Monopropylene Glycol, Propylene Glycol, Cucumber extract, Glycerine, Disodium Edta, Methyl paraben, Sorbeth-30, Methylisothiazolinone and Water. I think that it's as good as the My Beauty Diary masks. I really like the cute packaging ^_^!! This mask has a very nice scent and there is not too much product on it, it wasn't leaking or whatever when I grabbed the mask out. Besides, it's very moisturizing and it's also not sticky which is a big plus. 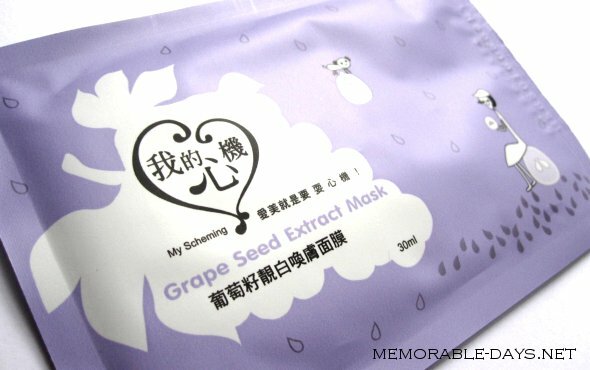 Overall, this mask is recommended ^^ especially if you like the nice scent of grapes. Have you tried masks of this brand before?